It is a great delight for my wife Pinghua and I to welcome you all to the Chinese Embassy. Tonight, the Chinese Embassy and Peking University have great pleasure to jointly present this “China Bel Canto”. Comparing with the Italian word “Bel Canto”, these days, we are more familiar with a portmanteau word of English “Brexit”. I guess many of you may have Brexit high on your mind, especially how to move on with it. Then there is the unexpected early conclusion of the leadership race of the Conservative Party. I am sure these topics were part of your conversations in the reception before the concert. From the conversations there is a clear conclusion. At the moment nothing is certain. The only certainty is uncertainty. I hope that all the uncertainties will be removed as quickly as possible. Then we can build confidence and continue to plan forward in a climate of certainty. It is clear now there is a new Conservative leader and there will be a new British Prime Minister by Wednesday. I hope this will bring about a good start. 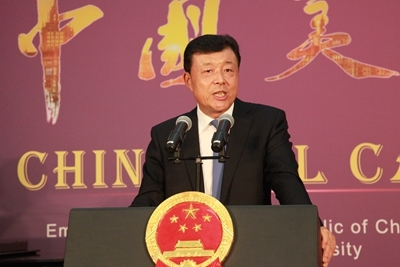 · It is certain that China remains strongly committed to the “Golden Era” of China-UK relations. · And it is certain that China remains strongly committed to China-UK business cooperation. Tonight’s concert, I believe, sends another explicit signal of certainty. 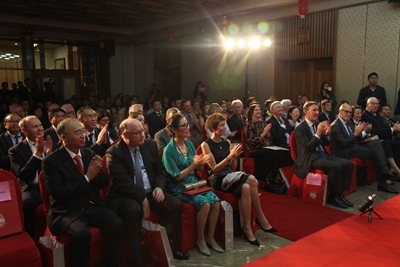 This is that China is also strongly committed to China-UK cultural exchanges. There is no reason to give up the cause that benefits the peoples of our two countries. There is no reason to deviate from the direction that we believe is the right one. · As its name reveals, it is a mixture of western bel canto and the rhythm of the Chinese language and folk music. · The concert features the singing technique of western opera and Chinese cultural elements. · In a sense, “China Bel Canto” is a typical example of open and inclusive cultural exchanges. This has enabled China to draw strength from western civilisation to promote the Chinese culture. Tonight, we welcome teachers and students from the Academy of Opera of Peking University. They will join Chinese and British singers to present the charm of the “China Bel Canto”. This will demonstrate the appeal of Chinese culture. It will bring to you a range of the best classics, including art songs, folk songs and traditional Chinese opera. I am confident this evening’s musical feast will mark a new highlight in China-UK culture exchanges. Through this the artists of both our two countries will add a musical dimension to help advance the “Golden Era” of China-UK relations. In conclusion, I wish the concert acomplete success. Also, I wish everyone a most enjoyable and musically memorable evening!